Updater, the publicly-traded startup that tries to turn the hassle of moving into a seamless and pain-free experience is expanding its support for the brokerage software it will work with, which the company says will make it available to thousands of new agents and brokers across the U.S.
Updater, launched by founder and CEO David Greenberg in 2011 on the back of a single developer, describes itself as a “concierge app” of moving, and gives people who relocate a digital hub where they can update everything from utilities to insurance. People get access to the service via referrals from their agents, and the company integrates with those agents’ management software so referrals are easy and seamless. Last week, Updater announced that it is integrating with six new brokerage software providers: AccountTECH, BackAgent, Brokermint, Docusign Transaction Rooms, Paperless Pipeline and Profit Power. The company previously integrated six other management services, and three of those have also been expanded. By integrating the new management software into it’s platform, Updater estimates it will become available to thousands of new brokerages. And that should translate into Updater becoming available to more than 1 million people who are moving, the company believes. Updater was initially nurtured by the National Association of Realtor’s startup accelerator and later received NAR venture capital funding. The company made headlines last year when it raised $45 million in funding. That funding is now paying off and helped the company launch two new features, which were also announced Thursday. One is a curated shopping service so people can easily find TV and internet at their new homes. The service will let people compare the prices of different providers based on their customized preferences. The idea is to narrow down options and simplify a process that can be overwhelming. The second new service, called “Secure Insurance,” helps people get new car, home, and other kinds of insurance at their new addresses. 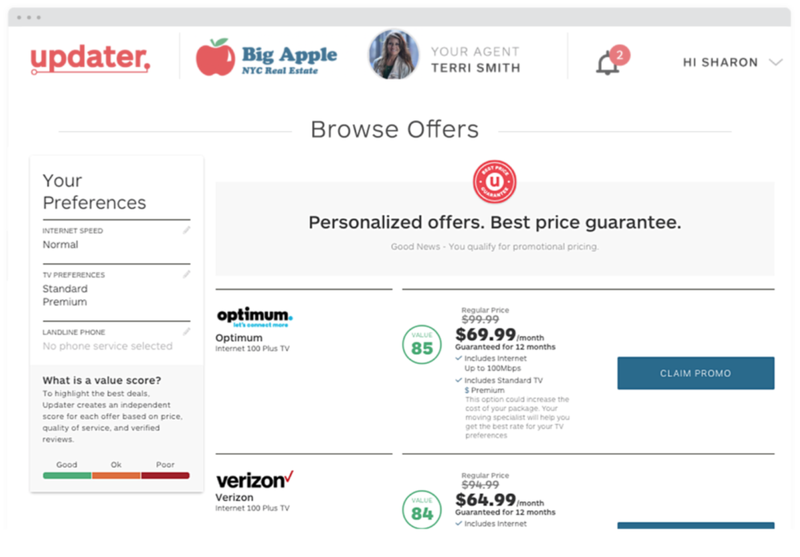 In addition to helping with TV and insurance, Updater can forward mail, update utilities, and connect people with moving companies. Users have to be invited by their agent or broker in order to access Updater. The company makes money by charging participating brokerages a fee, which start at $59 per month. Updater provides its services free to people relocating and aims to create an experience akin to what travelers might encounter when booking on Kayak.com.